It’s that time of year again . . . Back to School. I don’t know about you, but I love the excitement of setting up my room, organizing student supplies (new packs of crayons are the best), and setting goals for the year. In the past, I’ve written my goals as a list, as infographics, and even a Google Keep note. This year, I’m documenting my goals on my blog. Soooo, here goes. I have three major goals for the 2018-2019 school year. Last year, once of my goals was to implement a student-led classroom and flexible seating. I have to say, we nailed it. This year, I want to continue with both of these, but also ramp up student voice and leadership. For student voice, I’d like to amplify the voices of my students both literally and figuratively. I purchased a super cool karaoke microphone from Bonaok. I plan to introduce it during Smart Start so that it is a regular routine in the room. Of course, Flipgrid will be an integral part of class. My students loved it last year. This year I hope to go beyond our classroom and interact with a larger audience. Hopefully, we’ll have the opportunity to connect with other classes during the Global Read Aloud and through members of my PLN. For student leadership, I have two venues. One, I run the campus ASB. This is a great opportunity for students to hone their leadership skills. My principal and I have been working for the past four years creating opportunities for leadership including assemblies, school wide events, and self-selected projects. The other way I’d like to honor students as leaders is through our Passionate Kids Project. Last year, students navigated through their passion projects with great enthusiasm and produced phenomenal artifacts. This year, the sixth graders will be encouraged to give back to the community. I’m excited to see what they decide to do. I grew so much last year learning how to step aside and let students lead and make decisions. Their community projects will surely provide an opportunity to hone their voice and leadership skills. I’ve been on an inquiry journey for two years now. I have learned so much!!! The two books that have influenced me are “Dive into Inquiry” and “Inquiry Mindset”. I have truly been transformed as an educator. 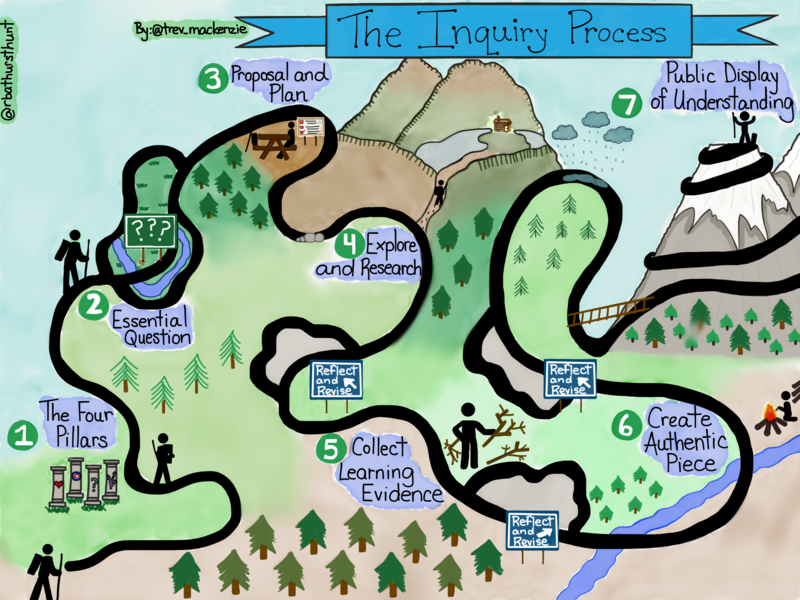 I’m going to continue to use “The Inquiry Process” for our passion projects. Additionally, I have 3 more goals to deepen our use of inquiry based learning. First, I plan to use more provocations with students. Engaging video clips, picture books, images, and hands-on artifacts will be perfect. Last year, I dabbled with the “What do you notice, wonder, and know?” questioning strategy. This year, I’d like students to document and lead the discussions. Second, I’d like to incorporate inquiry into our Wonders ELA curriculum. As part of our grade level unit openers, we can create a culture of fostering student questions. With the use of provocations, the unit theme, and student experiences, powerful learning can take place honoring both mandated curriculum and student interests. Students can take their initial wonderings and turn them into mini inquiry projects. I’m excited to see where our sixth graders will take us through their research and creation of artifacts. Third, I plan to implement SmashboardEdu into my inquiry units and design thinking challenges. I’ve watched the progression of the concept grow and am excited to give it a try. The structure of SmashboardEdu starts off with an authentic problem and students progress through a thinking process that culminates by solving and sharing their solution. For more information, here is the creator’s slide deck. Thank you, Dee, for the fantastic resource! 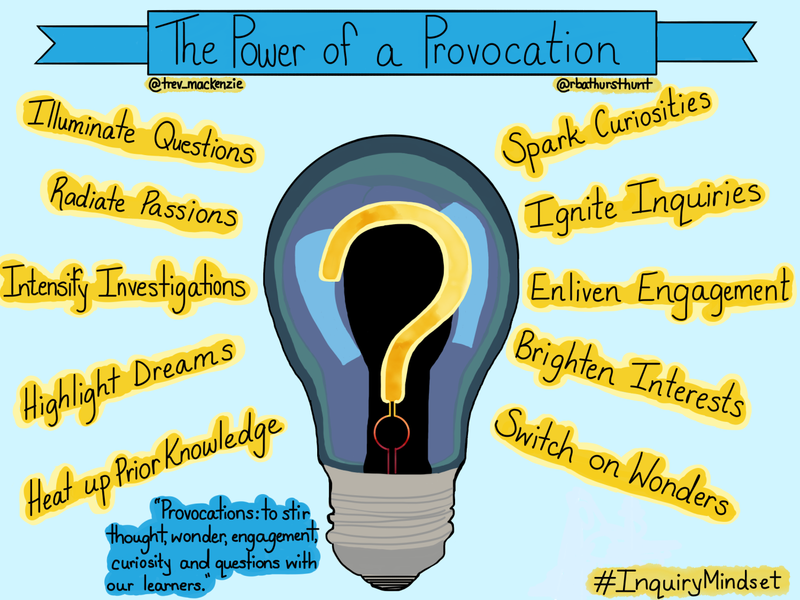 Finally, I’m hoping to share my passion for inquiry with others. I have a few possible opportunities on the horizon. Fingers crossed that they work out. I have to be completely honest here. I am awful with balance. I’m an all-in kind of person. Whatever it is that I’m doing, I give 110%. With that being said, I’m going to “try” really hard to have a reasonable work-life balance. My main goal is to have a completely work free day on Sunday and limit my time working at night. I especially have a tendency to “think” about work. I call it my percolating time, but I do need to limit that as well. I feel confident that I’ll make huge strides in this area. I have a supportive PLN that will encourage accountability throughout the year. As we start the new school year, many of us are setting goals to help us stay focused and be purposeful. Let’s encourage and uplift each other along way. May each of you have a blessed and productive 2018-2019 with your staff, colleagues, and students.